Page Street Publishing, 9781624143922, 192pp. Amanda Torres, founder of The Curious Coconut, tells a story of heritage and tradition with her recipes. In collaboration with her Puerto Rican mother-in-law, Milagros, she provides authentic recipes from Puerto Rico, Cuba, Colombia and Venezuela, among others. Discover a new, adventurous side to Paleo with recipes like Ropa Vieja (Shredded Beef in Tomato Sauce), Empanadas al Horno (Baked Meat Turnovers) and Pollo a la Brasa (Marinated Roasted Chicken). This is Paleo as you’ve never experienced before, embracing traditional Latin American comfort foods and also making them completely gluten-, dairy- and re ned-sugar-free. 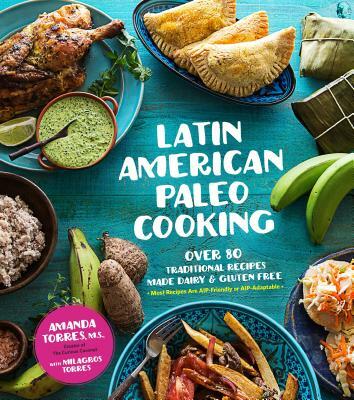 Latin American Paleo Cooking introduces layers of flavor, and with over 80 recipes, you’ll always have something new to try. Amanda Torres, founder of the food and health website The Curious Coconut, has achieved life-changing results from adopting a Paleo diet. She has been featured in Redbook, The Huffington Post, First for Women, Mark’s Daily Apple and others. She lives in Memphis, Tennessee.